I am on an high fantasy rush and when I stumbled upon this beautiful cover (doesn't she look like Daenerys Targaryen?? ) I knew I had to get my hands on it. Yes, I confess, I judge books by their cover. And in this case, the content really lived up to its stunning packaging. The story is set in a world where Gods are plaguing Caelira with magical storms for its denizens past wrongdoings. The only way to stay safe is to pledge allegiance to a Kingdom for protection. Kings and Queens are stromlings and the have different type of magic allowing them to control different kind of storms. This magic was totally new and fascinating and I totally loved this original world. 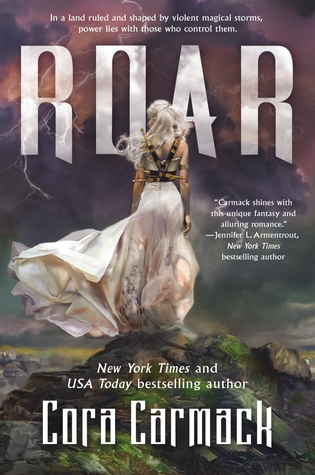 Aurora (a.k.a Roar) is the heir to her Queendom and if she wants to lead she needs to be able to protect it, so when she stumbles upon a band of storm hunters she sees to perfect opportunity, grasps it, and hold on for dear life. I loved how she joined this adventure under cover and was strong and fierce despite the odds against her. She is determined to succeed and her journey will be a difficult one. I absolutely loved the hunters. They each have their own personality with their strength and weaknesses and I enjoyed getting to know them. Bait was particularly funny, Jinx was colorful, Duke dependable, I don't like and don't trust Sly and Locke was beyond awesome and quite charming. Speaking of Locke, he is the love interest of this novel and even though they are both instantly attracted to each other it takes a long time for their relationship to develop and I really appreciate that. They fight, struggle, yell at each other and their interactions are always so raw. It's really great. The plot was engrossing and I enjoyed the adrenaline rush of the well described storm battling scenes. I wish this book was longer though, there could easily have been a 100 more pages of anticipation, action and building toward the end. My main complaint in this book is I want to know more. More about Roar's abilities, why she's different, what happens to her friend Nova and her own powers. I also wanted to know more about Cassius' real intentions and his plan. Really, this world is so engrossing, I just didn't want to let go and now I am sad I have to wait another year before I can pick up the next installment.